Zion Market Research has published a new report titled “Artificial Limbs Market by Product Type (Lower Extremity, Upper Extremity, Liners, and Sockets), by Technology (Electrically Powered, Cable Operated, and Cosmetic Prosthetics), and by End-User (Hospitals, Prosthetic Clinics, and Rehabilitation Centers): Global Industry Perspective, Comprehensive Analysis, and Forecast, 2018–2024”. 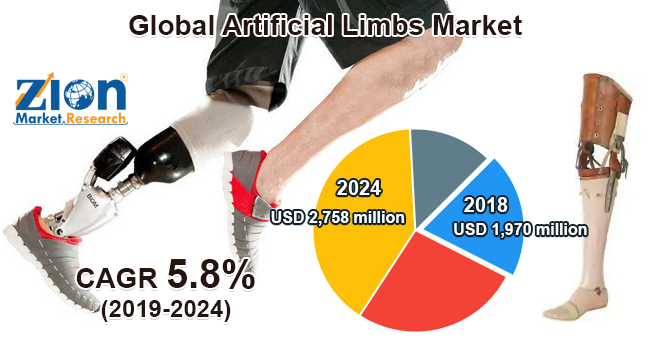 According to the report, the global artificial limbs market was valued at approximately USD 1,970 million in 2018 and is expected to generate around USD 2,758 million by 2024, at a CAGR of around 5.8% between 2019 and 2024. An artificial limb is also called a prosthetics device, which is used as a mechanical replacement for a missing limb. Artificial limbs are lightweight and high-strength custom fabricated devices that are used for amputees with lost their limbs caused by diseases or injuries. The materials used in artificial limbs comprise laminated fibers and plastics, willow wood, carbon-fiber composites, and different metallic alloys. Arm prosthesis, leg prosthesis, and cosmetic prosthesis are some types of prosthetics. The global artificial limbs market is likely to be driven by osteoarthritis, which affects the aging population the most and has triggered an increased demand for joint replacement surgeries. Other major factors projected to fuel the artificial limbs market globally are growing geriatric population and rising obese population. The global artificial limbs market is segmented on the basis of product type, technology, and end-user. By product type, the market is segmented into lower extremity, upper extremity, liners, and sockets. The lower extremity segment is expected to hold a substantial revenue share over the forecast timeline. The lower extremity segment includes transpelvic (hemipelvectomy), hip disarticulation, transfemoral (above knee amputation), through the knee amputations, transtibial (below knee amputations), ankle disarticulation, and partial foot amputation. Increasing geriatric population, unhealthy geriatric population, unhealthy lifestyle, and the rising number of overweight people globally, resulting in high incidences arthritis and osteoarthritis are likely to drive the lower extremity segment over the estimated time period. The technology segment of the artificial limbs market include electrically powered, cable operated, and cosmetic prosthetics. The electrically powered segment held the largest market share in 2018 and is expected to show the highest CAGR over the forecast time period. This can be attributed to the high adoption rate and the customizations available according to patients’ needs along with the ease and flexibility for stress-free movements. By end-user, the market is segmented into prosthetic clinics, hospitals, and rehabilitation centers. Hospitals are estimated to dominate the global artificial limbs market in the future. By region, North America is expected to dominate the global artificial limbs market in the future. Well-established medical devices industry, a rising number of research activities for development of novel devices, the growing prevalence of chronic disorders, and continuous technological advancements made in digital techniques across the region is expected to boost the growth of the artificial limbs market in North America over the estimated timeframe. Europe was the second largest market followed by the Asia Pacific region. The Asia Pacific artificial limbs market is projected to register the highest growth rate over the forecast time period, owing to increasing income and altering demographics across the region. The Middle Eastern and African and Latin American markets are expected to experience moderate growth in the years to come. Some key players of the global artificial limbs market are Ossur, Hanger, Inc., Ohio Willow Wood Company, Ottobock, RSL Steeper Group Ltd., PROTEOR, Blatchford Group, Liberating Technologies, Inc., Fillauer LLC, Spinal Technology, Inc., and Optimus Prosthetics, among others.